My heartfelt wishes for joy and good fortune to all of you in this most Magical of Seasons! That goes for every midwinter celebration around the world; whatever you decide to celebrate. Also, thank you so much for all of your interest and excitement in our witch family and the books as they come out. I imagine Taylor, Alejo, Olivia, and maybe even JaneAnn are in Vienna and Salzburg right now browsing through the Kirstkindlemarkts and listening to the midnight carolers the very old castles and churches there. And, if I know my racy bunch, they’ll undoubtedly go to some horse polo matches in the snow of St.Moritz and ski the Alps. Ahhh….to be witch, and live the way they do. 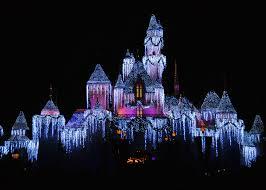 The photo above is from Disneyland in 2007. Isn’t it beautiful?